This tape consists of Stainless Steel Foil (Gr.304) which is coated with polyethylene or co-polymer film on both sides. Steel tape is widely used for armoring of optical fiber cables. The tape is tightly and continuously wound on metallic heavy duty center core to form pads without any joints. These pads are wrapped in air bubbles film to prevent damage during transportation and packed in wooden or cardboard boxes. 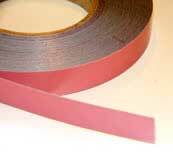 We offer very genuine rates for adhesive steel tapes.